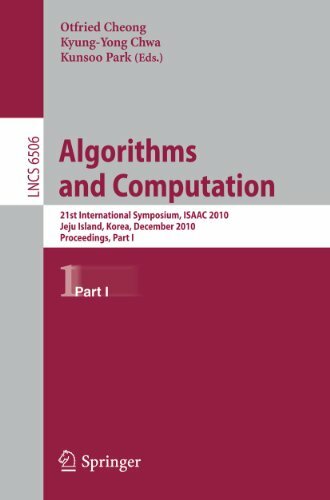 [PDF] Algorithms and Computation: 21st International Symposium, ISAAC 2010, Jeju Island, Korea, December 15-17, 2010, Proceedings, Part I (Lecture Notes in ... Computer Science and General Issues) | Free eBooks Download - EBOOKEE! Description: Product Description: This book constitutes the refereed proceedings of the 21st International Symposium on Algorithms and Computation, ISAAC 2010, held in Jeju, South Korea in December 2010. The 77 revised full papers presented were carefully reviewed and selected from 182 submissions for inclusion in the book. This volume contains topics such as approximation algorithm complexity data structure and algorithm combinatorial optimization graph algorithm computational geometry graph coloring fixed parameter tractability optimization online algorithm and scheduling. No comments for "[PDF] Algorithms and Computation: 21st International Symposium, ISAAC 2010, Jeju Island, Korea, December 15-17, 2010, Proceedings, Part I (Lecture Notes in ... Computer Science and General Issues)".